New! This 48" long nesting box can meet the needs of 45 egg-laying hens. 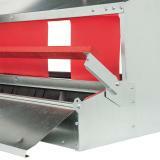 Reversible tray can face forward, or out the back, depending on your coop's design. 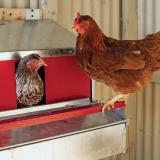 Roll-out design keeps eggs clean and away from egg-eating hens. Creates an instant nesting area for the flock. 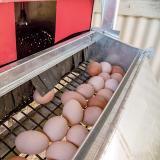 Reversible tray allows flockmasters to choose which direction eggs roll-out. Fold-up perch prevents hens from roosting in (and soiling) the boxes at night. Curtained nesting area provides ample privacy and security for the hens. Metal construction does not rot. Attractive nest egg that discourages egg eating. Won't break when dropped like ceramic eggs. 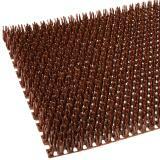 Encourages chickens, geese and quail to lay eggs in the preferred nesting areas. 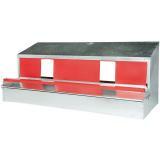 Encourages hens to lay eggs in their nesting boxes rather than elsewhere on the farm.